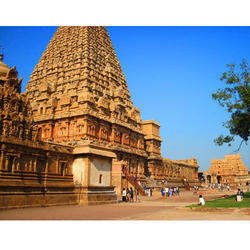 We are a leading Travel / Travel Agents / Transportation Services of brihadisvara temple thanjavur holiday package, ranganathaswamy temple tiruchirapalli holiday package, nataraja temple chidambaram holiday package, meenakshi temple holiday package, pancha rathas mahabalipuram holiday package and padmanabhapuram palace holiday package from New Delhi, India. Situated in the rich Kaveri Delta (the rice bowl of India), Tanjore is an old city where the Shiva temple of Brihadishvara of the 11th century recalls its past of being the capital of the powerful Chola Empire. Today, this city is the musical metropolis of meridional India. The palace houses a very beautiful art gallery. The Cholam Rajaraja museum exhibits a splendid collection of Chola bronze. Situated on a rocky promontory, Tiruchirapalli consists of an immense religious complex of Lord Vishnu in the temple of Ranganatha and a Shiva sanctuary in the temple of Jambukeshvara. The rock temple is a fortress occupying an impressive strategic position and houses sanctuaries of rock art. 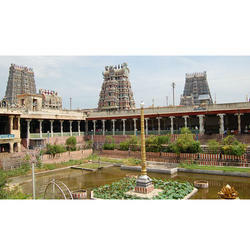 Chidambaram is an important pilgrimage centre. Hindu pilgrims visit Chidambaram to pray and to offer sacrifices at the temple of Shiva Nataraja, which is the most important temple of Dravidian India. The temple complex resembles a vast religious city enclosed by several walls with doors and high towers. 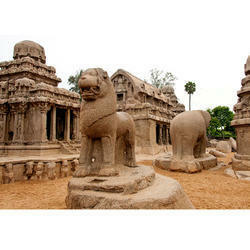 Probably the most venerable and ancient city of Tamil Nadu, Madurai is also the centre of Tamil education and culture. 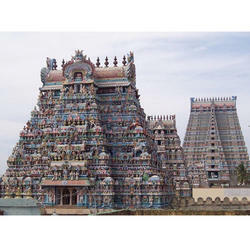 Its temple: Meenakshi Sundareshvara is a very important temple dedicated to Lord Shiva. You will get a strange feeling while walking across its labyrinth of courtyards and halls housing fantastic creatures. 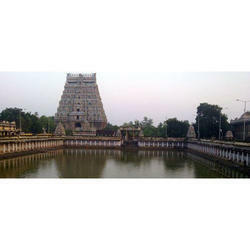 Madurai is a city whose heart beats in sync with the national legends of the country. It is truly a place of live cult. At sunrise, the famous bas-relief of "the descent of the Ganges ( also known as Arjuna's penance)" is a lesson in rock-cut art on Hindu mythology:Shiva, surrounded with divine creatures, is the source of the Ganges which flows like nectar from his matted locks. In the vicinity, a dozen other small temples deserve a detailed visit. The sun set from the famous shore temple, although ravaged but marvelously situated, is an unforgettable moment. The Palace of Padmanabhapuram (at 63 km or two and a half hours away by car from Trivandrum) was the capital of the ancient sovereign of Travancore. This magnificent palace is situated in Thuckalai, on the road to Kanyakumari. 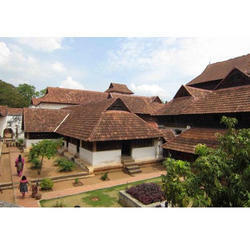 It is a wooden palace, well preserved, and a splendid example of the school of traditional architecture of Kerala. The extraordinary mural paintings, the exquisite sculptures of flowers and the lacquered floors in black granite have marvelously resisted the passage of time.